Their villas feature cedar floors, wood fireplace, private balcony, king size four poster bed, decadent deep spa bath. Be welcomed by glasses of bubbly and chocolates. Awake refreshed and enjoy a complimentary homemade fully cooked breakfast in their dining room overlooking the rainforest. The Edge House perched on a cliff has stunning views and accommodates up to six people in three bedrooms. Designed for self-catering, it has a fully equipped kitchen, two viewing platforms, log fireplaces, a triple spa bath and two bathrooms. Put your feet up in their private Gold Class Cinema or experience a rejuvenating massage in their award-winning Day Spa. They offer massage packages, facials, couples massages and the highest quality organic products. Bookings in advance are essential. 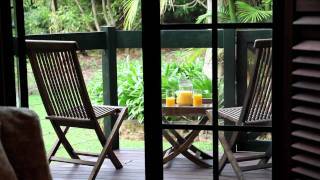 The Escarpment Retreat is owned by Oozz Holiday, providers of luxury accommodation on Mount Tamborine and Sanctuary Cove. Designed for couples, their romantic villas feature five metre high ceilings, sandstone walls, cedar floors, a sunken lounge room with a wood fireplace, private balcony, king size four poster canopy bed, granite kitchenette, generous bathroom complete with a large separate shower box and a decadent double spa bath. Awake refreshed and enjoy the sumptuous complimentary homemade gourmet breakfast in their dining room. 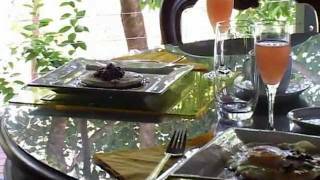 Indulge in the range of juices, cereals, breads, fruit, yoghurt, a choice of four mains, smooth freshly brewed organic Arabica coffee and selection of fine teas. The villas are complemented by a three bedroom family house, Day Spa, private Gold Class cinema and tree house common room, where you can enjoy complimentary welcoming champagne plus chocolates. Experience the ultimate in a family accommodation getaway. Escape to the spectacular Edge House, perched on a secluded cliff featuring two outdoor viewing decks with views over the rainforest valleys as far as the coast, two bathrooms, large jacuzzi, log fire places, open plan lounge and dining room, a fully equipped self-catering kitchen, dishwasher and barbecue in a garden setting. Check out time for the Edge House is 10:00 am.